How should I hold a remote? Should we keep the remote in our pocket? How do you feel about laser pointers? Try to find a device that fits comfortably in your hand, and allows you to move to the next visual with little thought or effort. We recommend that you stand to the right of the screen, and point with your left. When we present, the remote is most comfortable in our right hand, though it may also work in your left. Keeping the remote in our pockets tends to distract a little bit. It can get stuck and distract both the audience and the presenter. We don't like them. The benefits of laser pointers can be achieved in smarter ways, and the drawbacks are difficult to justify. Laser pointers amplify shaky hands and reveal a lack of planning. It's better and more interesting to plan and design the sections of a presentation you wish to deliver, in the order you wish to deliver them. Do I favor size or ubiquity? How do I feel about touch technology? Is there a hands-free option that will be effective? With our current technological options, I find myself making the kinds of compromise decisions that many presenters make. The standard choice is a small, light remote that feels good in the palm of your hand and has a USB connector. Physical, raised buttons lead forward, back and offer the option for a blank screen. We have also experimented with other approaches. When Bluetooth technology started to become available, Salling Software developed an elegant solution called Salling Clicker (Mac) (Windows) – It was a revelation! Your mobile phone could double as a presentation remote, so you were always ready to do a stand-up presentation, remote-in-hand. Still, as a solution it was a little distracting. I personally had a Nokia 6131 (like Jack Bauer's phone in early seasons of 24, even put in the ringtone). It was a clamshell phone, so when it was open, the screen would stay on and consume the battery; and when it was closed, the connection would be lost. I'm sure it has improved since, as have many phones. These days, smart and touch phone interfaces have several presentation remote options. RIM's Blackberry, Google's Android and Apple's iOS devices offer apps to control Microsoft Powerpoint and Apple Keynote. These solutions have great potential. There are glances at programs and solutions that deliver the ultimate digital, collaborative whiteboard in the palm of your hand. Presently, these devices are a little large and delicate for the remote function. More problematically, you need to look at them to change visuals. The other problem is that since the screen is on, it distracts presenters and their audiences. These devices become more useful if you have a stool or small table to support them. Bluetooth keyboards and mice are reliable computer interfaces, but share the drawbacks of requiring a surface, and in the keyboard's case, needing to be seen to get the right button. Asking an employee or a colleague to change your visuals… Wait, people are still doing that? Next! The first time I saw Microsoft's Kinect for XBox 360, I thought of presentations. What if future, more portable versions of this device were able to capture a subtle, uncommon hand gesture to move forward or back in a presentation. It would not impede expression, but would free your hands. Great care and cultural sensitivity would have to be a feature, as well as an integral part of selecting the gesture to not risk offending your audiences. 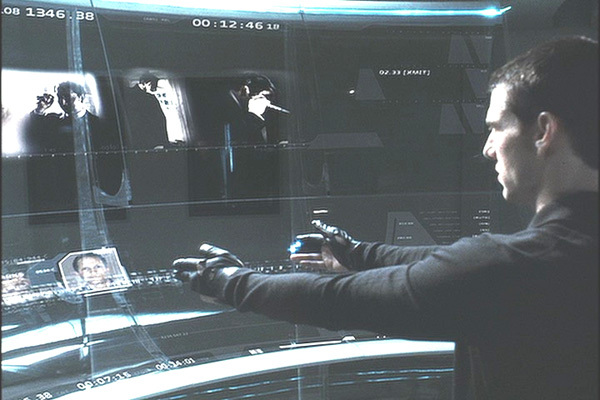 A large "Minority Report" style, multi-touch screen like John King uses on CNN is feasible. The presenter could interact with the screen like a whiteboard, and you could change slides by touching the screen. The problem with a large multi-touch screen, would be the presenter talking to the screen – All the time. A watch-like bluetooth device seems like it would be simple and elegant. Push the face to go forward, twist counter-clockwise to go back and tap a side button for blank screen. A wireless device that looks like a wah-wah pedal (used by guitarists) would be nice, but limited. The solution should help the presenter focus on the audience and vice-versa, it should also keep your presentation versatile and your hands free. Just a little speculation. What would your ideal presentation remote look like? This article is the second of a series. The purpose of The Future of Presenting is simple. We will use observation, study and writing to address the exciting new features and nascent problems of new communication technologies. This series looks to integrate well-established principles of communication with the potential advances in new technology. Read article 1, Powerpoint at 25 (almost) here.